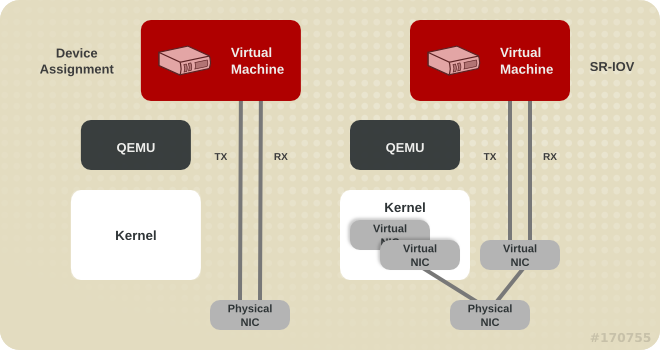 The Red Hat Enterprise Linux Virtualization Tuning and Optimization Guide covers KVM and virtualization performance. Within this guide you can find tips and suggestions for making full use of KVM performance features and options for your host systems and guest virtual machines. 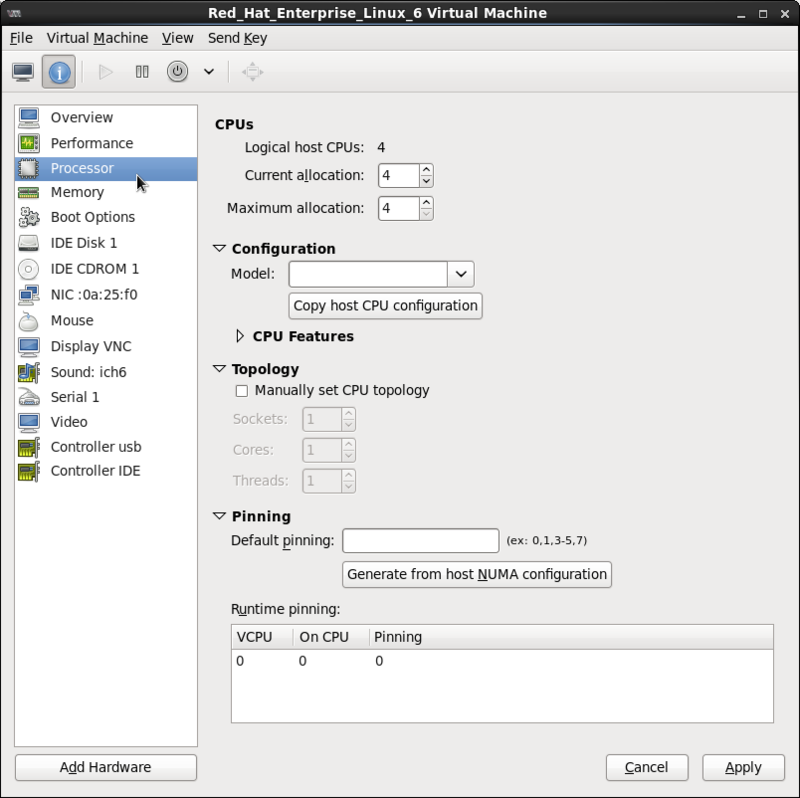 The Red Hat Enterprise Linux Virtualization Tuning and Optimization Guide contains details of configurable options and settings, and other suggestions that will help you achieve optimal performance of your Red Hat Enterprise Linux hosts and guest virtual machines. When using KVM, guests run as a Linux process on the host. Virtual CPUs (vCPUs) are implemented as normal threads, handled by the Linux scheduler. Guests inherit features such as NUMA and Huge Pages from the kernel. Disk and network I/O settings in the host have a significant performance impact. Network traffic typically travels through a software-based bridge. NUMA - Non-Uniform Memory Access. See Chapter 9, NUMA for details on NUMA. CFS - Completely Fair Scheduler. A modern class-focused scheduler. RCU - Read Copy Update. Better handling of shared thread data. Up to 160 virtual CPUs (vCPUs). Huge Pages and other optimizations for memory-intensive environments. See Chapter 8, Memory for details. vhost-net - a fast, kernel-based VirtIO solution. SR-IOV - for near-native networking performance levels. AIO - Support for a thread to overlap other I/O operations. MSI - PCI bus device interrupt generation. Scatter Gather - An improved I/O mode for data buffer handling. This chapter describes tools used to monitor guest virtual machine environments. You can use the perf command with the kvm option to collect guest operating system statistics from the host. In order to use perf kvm in the host, you must have access to the /proc/modules and /proc/kallsyms files from the guest. There are two methods to achieve this. Refer to the following procedure, Procedure 2.1, “Copying /proc files from guest to host” to transfer the files into the host and run reports on the files. Alternatively, refer to Procedure 2.2, “Alternative: using sshfs to directly access files” to directly mount the guest and access the files. If you directly copy the required files (for instance, via scp) you will only copy files of zero length. This procedure describes how to first save the files in the guest to a temporary location (with the cat command), and then copy them to the host for use by perf kvm. You now have two files from the guest (guest-kallsyms and guest-modules) on the host, ready for use by perf kvm. Using the files obtained in the previous steps, recording and reporting of events in the guest, the host, or both is now possible. If both --host and --guest are used in the command, output will be stored in perf.data.kvm. If only --host is used, the file will be named perf.data.host. Similarly, if only --guest is used, the file will be named perf.data.guest. The following example command uses the file obtained by the recording process, and redirects the output into a new file, analyze. This is provided as an example only. You will need to substitute values according to your environment. This chapter covers performance tuning options for virt-manager, a desktop tool for managing guest virtual machines. The virt-manager tool provides different profiles depending on what operating system type and version are selected for a new guest virtual machine. When creating a guest, you should provide as many details as possible; this can improve performance by enabling features available for your specific type of guest. Removing unused or unnecessary devices can improve performance. For instance, a guest tasked as a web server is unlikely to require audio features or an attached tablet. Several CPU related options are available to your guest virtual machines. Configured correctly, these options can have a large impact on performance. The following image shows the CPU options available to your guests. The remainder of this section shows and explains the impact of these options. Use this option to adjust the amount of virtual CPUs (vCPUs) available to the guest. It is also possible to change the number of vCPUs while the guest is running, which is referred to as hot plugging and hot unplugging. The hot unplugging feature is only available as a Technology Preview. Therefore, it is not supported and not recommended for use in high-value deployments. CPUs are overcommitted when the sum of vCPUs for all guests on the system is greater than the number of host CPUs on the system. You can overcommit CPUs with one or multiple guests if the total number of vCPUs is greater than the number of host CPUs. As with memory overcommitting, CPU overcommitting can have a negative impact on performance, for example in situations with a heavy or unpredictable guest workload. Refer to the Red Hat Enterprise Linux 6 Virtualization Administration Guide for more details on overcommitting. Copying the host CPU configuration is recommended over manual configuration. Alternately, run the virsh capabilities command on your host machine to view the virtualization capabilities of your system, including CPU types and NUMA capabilities. Although your environment may dictate other requirements, selecting any desired number of sockets, but with only a single core and a single thread usually gives the best performance results. Large performance improvements can be obtained by adhering to the system's specific NUMA topology. Use this option to automatically generate a pinning configuration that is valid for the host. Do not use this option if the guest has more vCPUs than a single NUMA node. Using the Pinning option will constrain the guest's vCPU threads to a single NUMA node; however, threads will be able to move around within that NUMA node. For tighter binding capabilities, use the output from the lscpu command to establish a 1:1 physical CPU to vCPU binding using virsh cpupin. Refer to Chapter 9, NUMA for more information on NUMA and CPU pinning. Several virtual disk related options are available to your guest virtual machines during installation that can impact performance. The following image shows the virtual disk options available to your guests. When setting the virtual disk performance options in virt-manager, the virtual machine must be restarted for the settings to take effect. See Section 7.3, “Caching” and Section 7.4, “I/O Mode” for descriptions of these settings and instructions for editing these settings in the guest XML configuration. This chapter covers using tuned daemon for dynamically tuning system settings in virtualized environments. tuned is a tuning profile delivery mechanism that adapts Red Hat Enterprise Linux for certain workload characteristics, such as requirements for CPU-intensive tasks, or storage/network throughput responsiveness. It can react to changes in CPU and network use and adjust settings to improve performance in active devices, or reduce power consumption in inactive devices. The accompanying ktune partners with the tuned-adm tool to provide a number of tuning profiles that are pre-configured to enhance performance and reduce power consumption in a number of specific use cases. Edit these profiles or create new profiles to create performance solutions tailored to your environment. Based on the enterprise-storage profile, virtual-guest also decreases the swappiness of virtual memory. This profile is available in Red Hat Enterprise Linux 6.3 and later, and is the recommended profile for guest machines. Based on the enterprise-storage profile, virtual-host also decreases the swappiness of virtual memory and enables more aggressive writeback of dirty pages. This profile is available in Red Hat Enterprise Linux 6.3 and later, and is the recommended profile for virtualization hosts, including both KVM and Red Hat Enterprise Virtualization hosts. It is possible to create custom tuned profiles to encapsulate a set of tuning parameters. For instructions on creating custom tuned profiles, refer to the tuned.conf man page. Refer to the Red Hat Enterprise Linux 6 Power Management Guide for further information about tuned, tuned-adm and ktune. This chapter covers network optimization topics for virtualized environments. Use multiple networks to avoid congestion on a single network. For example, have dedicated networks for management, backups and/or live migration. Usually, matching the default MTU (1500 bytes) in all components is sufficient. If you require larger messages, increasing the MTU value can reduce fragmentation. If you change the MTU, all devices in the path should have a matching MTU value. Use arp_filter to prevent ARP Flux, an undesirable condition that can occur in both hosts and guests and is caused by the machine responding to ARP requests from more than one network interface: echo 1 > /proc/sys/net/ipv4/conf/all/arp_filter or edit /etc/sysctl.conf to make this setting persistent. The following diagram demonstrates the involvement of the kernel in the Virtio and vhost_net architectures. vhost_net moves part of the Virtio driver from the user space into the kernel. This reduces copy operations, lowers latency and CPU usage. The following diagram demonstrates the involvement of the kernel in the Device Assignment and SR-IOV architectures. Device assignment presents the entire device to the guest. SR-IOV needs support in drivers and hardware, including the NIC and the system board and allows multiple virtual devices to be created and passed into different guests. A vendor-specific driver is required in the guest, however, SR-IOV offers the lowest latency of any network option. This chapter covers disk performance optimization topics for virtualized environments. You can use an I/O scheduler to improve disk performance both when Red Hat Enterprise Linux is the virtualization host and when it is the virtualization guest. When using Red Hat Enterprise Linux as a host for virtualized guests, the default cfq scheduler is usually ideal. This scheduler performs well on nearly all workloads. However, if minimizing I/O latency is more important than maximizing I/O throughput on the guest workloads, it may be beneficial to use the deadline scheduler. The deadline scheduler is also the scheduler used by the tuned profile virtual-host. Red Hat Enterprise Linux guests often benefit greatly from the noop scheduler. This noop scheduler allows the host machine or hypervisor to optimize the input/output requests. The noop scheduler can combine small requests from the guest operating system into larger requests, before handing the I/O to the hypervisor. However, noop tries to use the fewest number of CPU cycles in the guest for I/O scheduling. The host/hypervisor has an overview of the requests of all guests and uses a separate strategy for handling I/O. For Red Hat Enterprise Linux 7.2 and newer, virtio-blk always uses noop implicitly. This is because it uses blk-mq. Depending on the workload I/O and how storage devices are attached, schedulers like deadline can be more advantageous. Performance testing is required to verify which scheduler is the best one to use in each situation. All scheduler tuning should be tested under normal operating conditions, as synthetic benchmarks typically do not accurately compare performance of systems using shared resources in virtual environments. Guests using storage accessed by iSCSI, SR-IOV, or physical device passthrough should not use the noop scheduler. These methods do not allow the host to optimize I/O requests to the underlying physical device. In virtualized environments, sometimes it is not beneficial to schedule I/O on both the host and guest layers. If multiple guests use storage on a filesystem or block device managed by the host operating system, the host may be able to schedule I/O more efficiently because it is aware of requests from all guests and knows the physical layout of storage, which may not map linearly to the guests' virtual storage. On the other hand, depending on the workload, it may be beneficial to use a scheduler like deadline in the guest virtual machine. The I/O scheduler is configured one way for Red Hat Enterprise Linux 5 and 6 and a different way for Red Hat Enterprise Linux 7. The I/O scheduler can be selected at boot time using the elevator kernel parameter. In the following example grub.conf stanza, the system is configured to use the noop scheduler. The example shown is for VMware ESX. The virsh blkiotune command allows administrators to set or display a guest virtual machine's block I/O parameters manually in the <blkio> element in the guest XML configuration. The I/O weight, within the range 100 to 1000. A single string listing one or more device/weight pairs, in the format of /path/to/device,weight,/path/to/device,weight. Each weight must be within the range 100-1000, or the value 0 to remove that device from per-device listings. Only the devices listed in the string are modified; any existing per-device weights for other devices remain unchanged. Add the --config option for changes to take effect at next boot. Add the --live option to apply the changes to the running virtual machine. The --live option requires the hypervisor to support this action. Not all hypervisors allow live changes of the maximum memory limit. Add the --current option to apply the changes to the current virtual machine. See # virsh help blkiotune for more information on using the virsh blkiotune command. 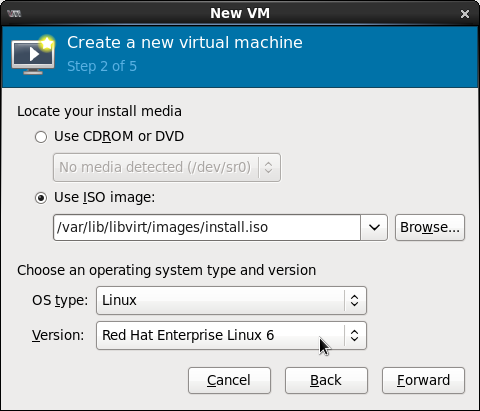 I/O mode options can be configured on a virtual machine during installation with virt-manager or the virt-install command, or on an existing guest by editing the guest XML configuration. IO=native The default for Red Hat Enterprise Virtualization environments. 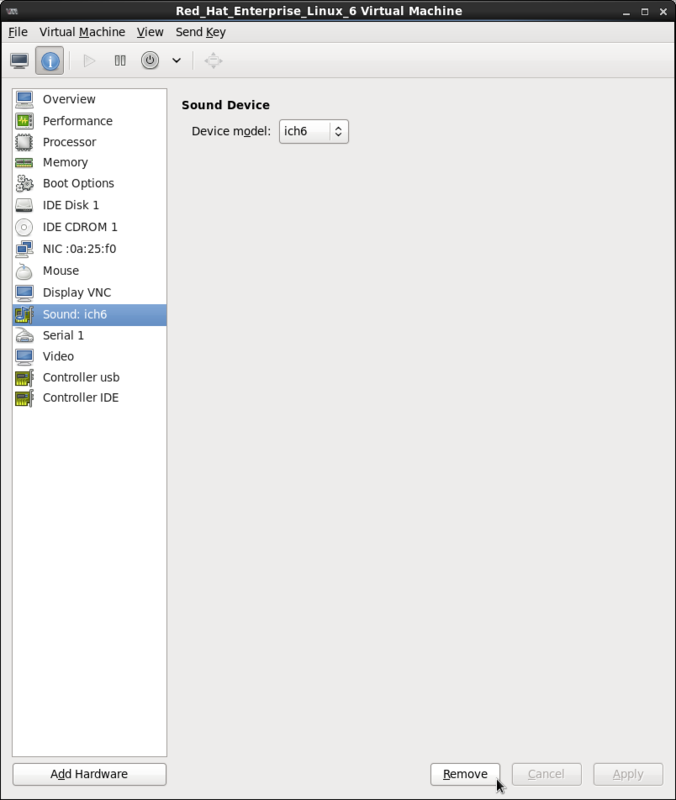 This mode uses kernel asynchronous I/O with direct I/O options. IO=threads Sets the I/O mode to host user-mode based threads. IO=default Sets the I/O mode to the kernel default. In Red Hat Enterprise Linux 6, the default is IO=threads. This chapter covers memory optimization options for virtualized environments. Do not allocate more resources to guest than it will use. If possible, assign a guest to a single NUMA node, providing that resources are sufficient on that NUMA node. For more information on using NUMA, see Chapter 9, NUMA. For details on using these performance tools, refer to the Red Hat Enterprise Linux 6 Performance Tuning Guide and the man pages for these commands. Red Hat Enterprise Linux 6.6 and later includes support for locking a virtual machine's memory pages in the host memory with the locked parameter. Red Hat Enterprise Linux 6.7 systems support 2 MB and 1 GB huge pages, which can be allocated at boot or at runtime. The next two steps must also be completed the first time you allocate 1 GB huge pages at boot time. 1 GB huge pages are now available for guests. 1 GB huge pages can also be allocated at runtime. Runtime allocation allows the system administrator to choose which NUMA node to allocate those pages from. However, runtime page allocation can be more prone to allocation failure than boot time allocation due to memory fragmentation. This example command allocates 4 1 GB huge pages from node1 and 1024 2MB huge pages from node3. The next two steps must also be completed the first time you allocate 1 GB huge pages at runtime. Kernel same-page merging (KSM) stores monitoring data in the /sys/kernel/mm/ksm/ directory. Files in this directory are updated by the kernel and are an accurate record of KSM usage and statistics. The variables in the list below are also configurable variables in the /etc/ksmtuned.conf file, as noted above. Whether pages from different NUMA nodes can be merged. Kernel same-page merging (KSM) has a performance overhead which may be too large for certain environments or host systems. KSM may also introduce side channels that could be potentially used to leak information across guests. If this is a concern, KSM can be disabled on per-guest basis. After this is performed, the khugepaged daemon can rebuild transparent hugepages on the KVM guest physical memory. Using # echo 0 >/sys/kernel/mm/ksm/run stops KSM, but does not unshare all the previously created KSM pages (this is the same as the # systemctl stop ksmtuned command). Strict policy means that the allocation will fail if the memory cannot be allocated on the target node. Specifying a NUMA nodeset list without defining a memory mode attribute defaults to strict mode. Memory pages are allocated across nodes specified by a nodeset, but are allocated in a round-robin fashion. Memory is allocated from a single preferred memory node. If sufficient memory is not available, memory can be allocated from other nodes. If memory is overcommitted in strict mode and the guest does not have sufficient swap space, the kernel will kill some guest processes to retrieve additional memory. Red Hat recommends using preferred allocation and specifying a single nodeset (for example, nodeset='0') to prevent this situation. Generally, optimal performance on NUMA systems is achieved by limiting guest size to the amount of resources on a single NUMA node. Avoid unnecessarily splitting resources across NUMA nodes. You can run numad to align the guests' CPUs and memory resources automatically. However, it is highly recommended to configure guest resource alignment using libvirt instead: . Running numastat with -c provides compact output; adding the -m option adds system-wide memory information on a per-node basis to the output. Refer to the numastat man page for more information. For optimal performance results, memory pinning should be used in combination with pinning of vCPU threads as well as other hypervisor threads. The lstopo tool can be used to visualize NUMA topology. It can also help verify that vCPUs are binding to cores on the same physical socket. Refer to the following Knowledgebase article for more information on lstopo: https://access.redhat.com/site/solutions/62879. Pinning causes increased complexity when there are many more vCPUs than physical cores. 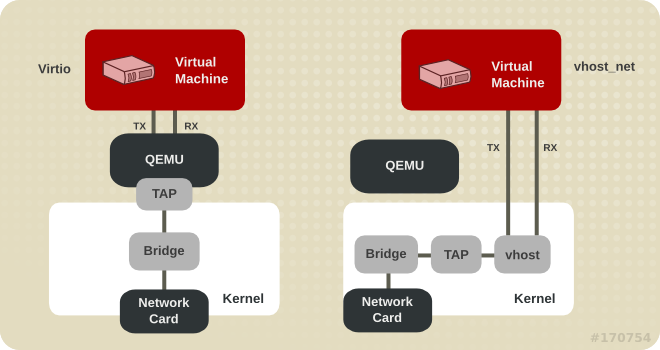 Kernel SamePage Merging (KSM) allows virtual machines to share identical memory pages. From Red Hat Enterprise Linux 6.5, KSM can detect that a system is using NUMA memory and control merging pages across different NUMA nodes. Use the sysfs /sys/kernel/mm/ksm/merge_across_nodes parameter to control merging of pages across different NUMA nodes. By default, pages from all nodes can be merged together. When this parameter is set to zero, only pages from the same node are merged. Generally, unless you are oversubscribing the system memory, you will get better runtime performance by disabling KSM sharing. When KSM merges across nodes on a NUMA host with multiple guest virtual machines, guests and CPUs from more distant nodes can suffer a significant increase of access latency to the merged KSM page. For more information about tuning memory settings with the <memoryBacking> element, see Section 8.3.2, “Memory Tuning with virsh”.